You can create a mobile hotspot with your Windows 10 Mobile phone to share your cellular data connection with other devices. 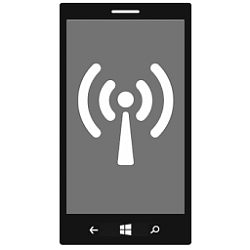 This tutorial will show you how to setup and turn on or off mobile hotspot to share your cellular data connection over Wi-Fi from your Windows 10 Mobile phone with other devices. This uses cellular data and depends on your phone plan for costs. Wi-Fi can't be used on your phone while you have mobile hotspot turned on. This setting is only available when you select share your cellular data connection over Wi-Fi in step 3 above. Changing the network name or password will disconnect all currently connected devices. Both devices must have Bluetooth turned on and be paired for the device to be able to remotely automatically turn on the mobile hotspot on your phone.